Pebble HD Hand Held Portable Electronic Magnifier from HealthyKin.com features a new HD camera providing a crisp, clear, colorful, high definition picture. A new ergonomic lightweight compact design makes it the perfect companion whether at home or on the go. Carry Pebble HD in your purse, pocket, or clip it on your belt with the included carrying case. Pebble HD takes everything users loved about the original Pebble, and made it even better with a new high definition camera and an innovative light-weight ergonomic design. The colorful 4.3" HD display provides uncompromised power and clarity, giving consumers a vibrant, bold image with fully adjustable magnification between 1.25x - 13.5x. Weighing less than 8 ounces, and thin enough to slide into a pocket, Pebble HD is the perfect companion. Enhanced Vision re-imagined Pebble to be the definitive hand-held electronic magnifier with a new lightweight, ergonomic design that allows for absolute portability; you only know it's there when you need it. 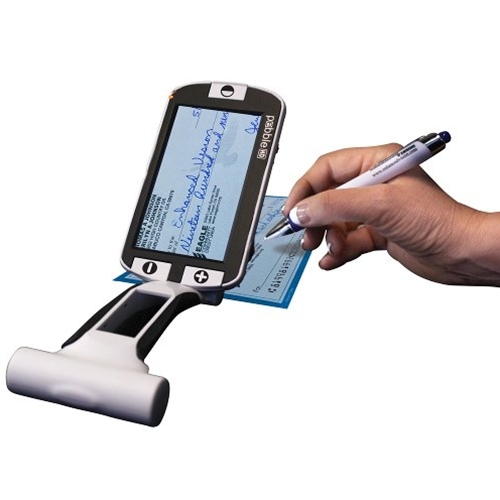 Offering convenience with mobility, Pebble HD is a multi-purpose, fully adjustable low vision solution that gives visually impaired users the ability to instantly read mail, write checks, or examine items simply and effectively. No more squinting and no more hassle switching between glass lenses or awkward, bulky contraptions; the Pebble HD's compact size and strength lets visually impaired consumers keep their independence with reliable magnification that is readily available. Effectiveness, functionality, and ease of use; all things best describing Pebble HD and also what low vision consumers expect in assistive technology. The original Pebble has been remodeled and refined for a high definition world. A stunning, colorful display with deeper magnification and easy-to-use tactile buttons, Pebble HD is ready for anything. 28 different viewing modes (with an adjustable brightness level and light) allow Pebble HD to be used in a wide variety of situations, from dimly lit restaurants to the local pharmacy. 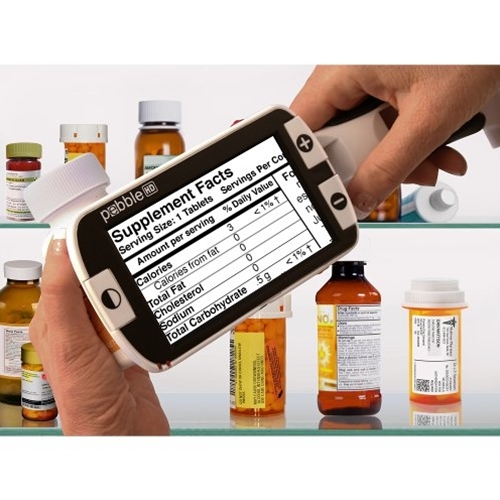 Visually impaired users can avoid the hassle of writing down information by using the Pebble HD to snap a picture of a label with the push of a button, saving the information for later.ned Pebble to be the definitive hand-held electronic magnifier with a new lightweight, ergonomic design that allows for absolute portability; you only know it's there when you need it. Offering convenience with mobility, Pebble HD is a multi-purpose, fully adjustable low vision solution that gives visually impaired users the ability to instantly read mail, write checks, or examine items simply and effectively. No more squinting and no more hassle switching between glass lenses or awkward, bulky contraptions; the Pebble HD's compact size and strength lets visually impaired consumers keep their independence with reliable magnification that is readily available. Does a good job.at times,the handle becomes a little bulky,although it does fold under the unit comfortably.